Slow cooker bourbon pulled chicken with hot sauce is a terrific crowd pleaser. I make chicken in the slow cooker often, however this one is always a big hit because of the sauce in it. It's perfect for pot luck, events and is delicious even when prepared ahead of time for the big game parties. The best thing about my slow cooker is everything that's cooked is falls apart tender. The chicken in hot sauce is the perfect buffalo hot sauce sandwich! You can use this also over rice, pasta, baked potatoes and tortilla shells for an over the top taco! The best sandwich in a slow cooker ever! These Slow Cooker Bourbon Pulled Chicken Sandwiches are popular all over the South. Anywhere we go there is a pulled pork sandwich on the menu. We love using chicken in it's place. Of course you can use pork if you're a diehard pork lover. This chicken pulled apart so easy, if your a wing lovers this was awesome! Oh, one more thing it didn't heat up the house in this hot weather and everyone loved it during our sports game day get together! Give this one a try you are going to be pleasantly surprised! Slow Cooker Bourbon Pulled Chicken Sandwiches can be dressed up. Try them with blue cheese dressing, bacon crumbled, lettuce, tomatoes, sliced olives, sauteed mushrooms and peppers and you can make a whole topping bar. You can come up with loads of ideas for toppings or just serve them on toasted garlic rolls or just plain delicious hard rolls. Whatever you decide to add to your sandwich will be a bonus because it's fabulous plain with nothing else! These will feed a crowd easily! The best thing about these Slow Cooker Bourbon Pulled Chicken Sandwiches besides being mouth watering tender and over the top delicious there is one more big factor! These Slow Cooker Bourbon Pulled Chicken Sandwiches are super easy to make and can feed a large family or gathering at any event or picnic. So the next time you need to feed a large amount of people, you need to get that slow cooker out! Start making this inexpensive delicious Slow Cooker Bourbon Pulled Chicken Sandwiches for the gang. You won't be sorry, believe me you will be getting a ton of compliments and they will be asking for your recipe. In a crockpot place chicken in an oil sprayed crock liner. Pour bourbon and soda over all the chicken and place on high for 4 to hours. After it's fork tender, drain off some juice, shred with two forks, add a bottle of hot sauce with spices on top of the chicken. Serve on buns with blue cheese dressing or ranch and sharp cheddar cheese and whatever toppings you love. I love buffalo chicken...this sounds so easy...I need to use my crockpot more often. The slow cooker was one of the appliances we left behind when moving from Denver to DC earlier this year. But, I don't miss it. I've got a couple of heavy pots that can simmer on the stove or in the oven forever. The look and sound of your pulled chicken has me wanting to go out to breadfast (it's 8 am here) even though I never eat breakfast. You had me with comparing the flavor to wings. Perfect recipe to make for when I am rooting for my Steelers. Bookmarking this for game day. I am sitting here looking at slow cooker recipes trying to come up with a good one and you hand me this. I see this recipe in my future. I wish I could have this for my dinner! Looks absolutely mouthwatering! You always make me hungry;)) This is one awesome lunch!!! I haven't used my crock pot in a while. I need to get on it! This would be perfect for a crowd during the last days of summer. 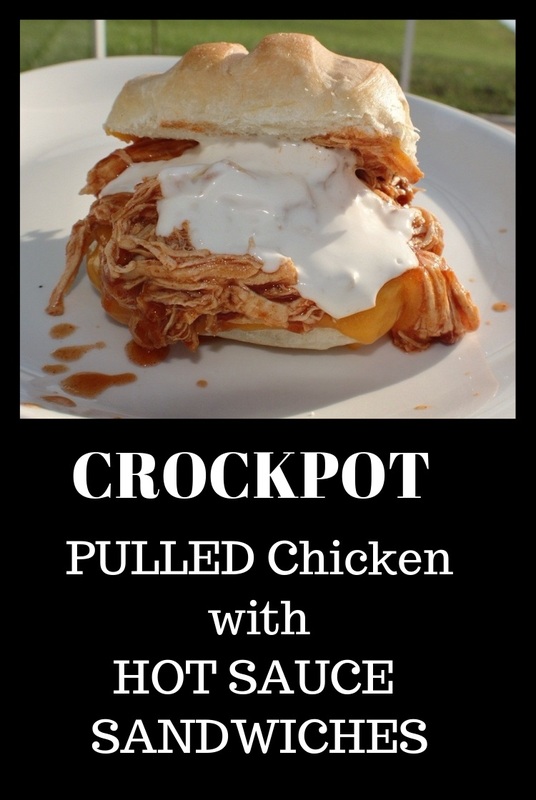 I don't think to use my crockpot in the warm months, but this is a great recipe to enjoy now. I'm bookmarking this one for one DSO's daughter and fiance come over. Looks delish....Who doesn't love buffalo chicken? Awesome sandwiches, love the spicy kick with the hot sauce and the creamy blue cheese dressing, yum! This is brilliant! My husband, who LOVES buf wings will flip for this. Thanks for another great recipe, Claudia! I wish I had this for lunch! It looks delicious! Chicken, Sandwiches, and hot sauce. This sandwich is right up my husband's alley! It looks really tasty! I love using the crockpot for cooking meat! So tender and yummy! This looks so amazing. I am so impressed. Holy yum! We are hot sauce lovers!! I make pulled chicken with BBQ sauce this way but never with hot sauce. My hubby will LOVE this. Must try soon! This sounds amazing! Buffalo chicken on a bun. How cool!!! And definitely going on my go to list. Wow this sounds simple, hot and delightful. I like that it doesn't have butter in it. I can't stomach hot wings because the combination of hot sauce and butter makes me feel sick to my stomach. This sounds great for a get together or super bowl party. Wow! This looks perfect for our upcomming back to school season...a simple crockpot dish that everyone will like!! Yum! Oh I think this sounds better than hot wings! Slow cookers do a wonderful job on meat and poultry, love the shredded effect. This is great for pot luck or tailgating party. Thanks for sharing! Hmm, sounds like something my sons would really go for in a big way! This reminds me of buffalo wings with the bleu cheese sauce, I love it. Not sure what the plastic liner is for, but those sandwiches look great. Is that Ciabatta bread rolls? oh boy. Thanks for the great recipe. I love the idea of the crock pot, but don't have many good recipes! This looks like a keeper! This recipe comes just in time for football season. I know the guys in my house will be in heaven eating this during the game! What a delicious SANDWICHES! I simply cannot wait to try it! Very interesting combination of ingredients. I am saving this recipe for later. Claudia, there are a lot of chicken sandwich recipes out there but I like how different this one is, yet it's still super easy. The sauce is a great idea! Looking forward to making this at my family's next get-together. Oh my goodness, how yummy! I love easy, slow cooker recipes like this one. My husband would love it too! My husband loves pulled pork sandwiches! Now I don't have to hassle with the oven, thank you for much for this recipe.